Weddings are a joyous occasion but can get expensive when you’re in a hurry. With wedding crafts you can hold the price down and at the same time, add a personal touch to your big day. We have listed a few ideas for wedding crafts to add that sparkle and creativity to your wedding. If you’re wondering how to make a wedding veil from scratch, we’ve got a solution for you. In fact it is not too hard to make your own DIY wedding veil. To create it, you will need a piece of bridal illusion tulle in your desired length. You will also need a comb to attach it to your hair and a hat or headpiece to cover the comb. Sew large running stitches about an inch from the end of the illusion tulle and gather it tightly. Next, sew the veil to the comb and top with hat or headpiece. As an alternative, you can decorate a wide-brimmed straw hat with silk flowers, ribbon, and pearls. As the wedding bouquets and floral arrangements can also be personally crafted, why not having your own DIY wedding flower centerpieces? For a simple outdoor wedding, consider wild flowers which are free and have a charm all their own. Lilies, geraniums or daisies from your garden or a meadow will make a cute rustic wedding table floral arrangement. Bouquets can be arranged in large clear vases, with a bow tied elegantly around. 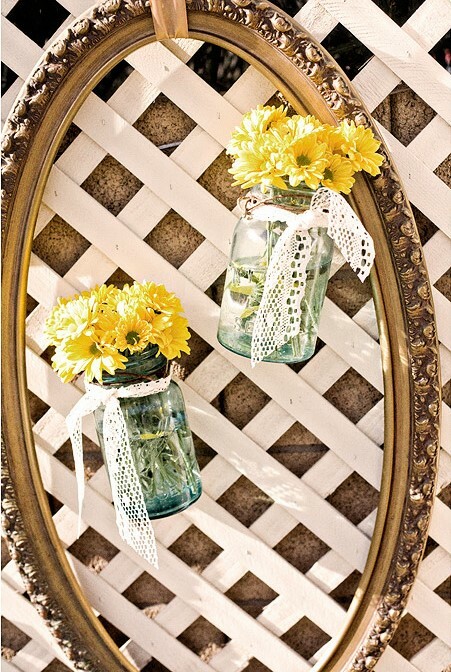 Wedding crafts with mason jars containing flowers are particularly favored to make a rustic wedding decoration. 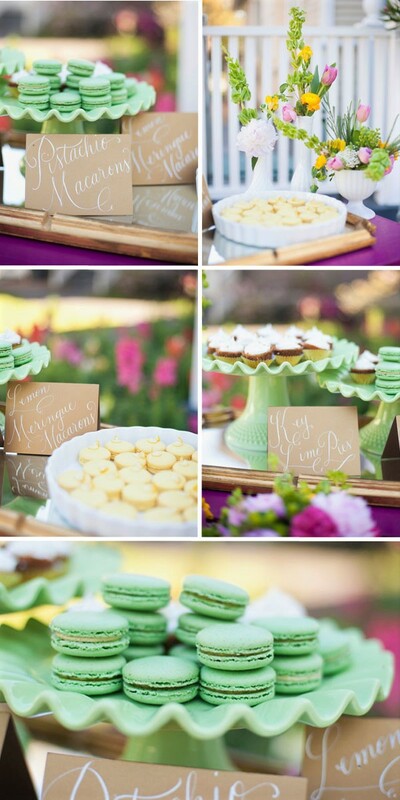 Favors for the guests are particularly appropriate wedding crafts. One of the popular wedding favors ideas are refrigerator magnets which are a simple and well-received favor. It would be really nice to make a magnetic picture frame and include a picture of the newly wed couple. You could cut a frame out of craft foam in one of the wedding colors, arrange over the photo, and glue all onto a cardboard backing. Place self-adhesive magnet tape on the back of the cardboard. Then, decorate the front of the frame with foil heart stickers and a monogram of the couple's last name. Wedding favors that double as place cards can be made by purchasing sugar cookies from a local bakery that are iced in white. Pipe each guest's names on the cookies in colored icing a day or two before the wedding. Place in cellophane bags, tied with a ribbon, and set at each guest's place setting so guests know where to sit. DIY wedding bows for the ends of the pews or rows make simple wedding crafts. Wide velvet ribbons are nice for fall and winter weddings, while satin is more appropriate for spring and summer weddings. Loop some flat lace in with the ribbons. In the center of the completed bow, attach some silk flowers and pearl sprays with a hot glue gun. 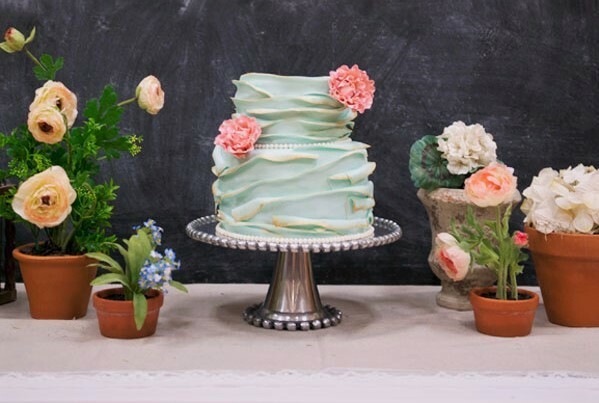 Perhaps you'd like to try your hand at decorating your own wedding cake. Check the craft section of the department store for pans and gadgets of all types to help you create a cake to remember. You may consider purchasing a decorated sheet cake from a local bakery in addition to a smaller tiered cake. Then combine them together as one elaborate cake with piping and rose petals. But bear in mind that it takes a steady hand so be sure to practice before starting on the real cake. Check out our other page to learn more about wedding cake designs. One good option would be choosing sweet colorful little wedding cupcakes which can make your wedding party really a unique one. Cupcakes are increasingly popular, as these small cake pieces are easier to eat and are also great delights to the kids and also to the adults. They can be home made in many different types of flavors and they can also be decorated with lots of creativity. Preparing for a wedding can be expensive, but with wedding crafts, you can take some of the sting out. However, you need to plan early because it will take a little while to make favors for everyone and all the other little details you will want to take care of. 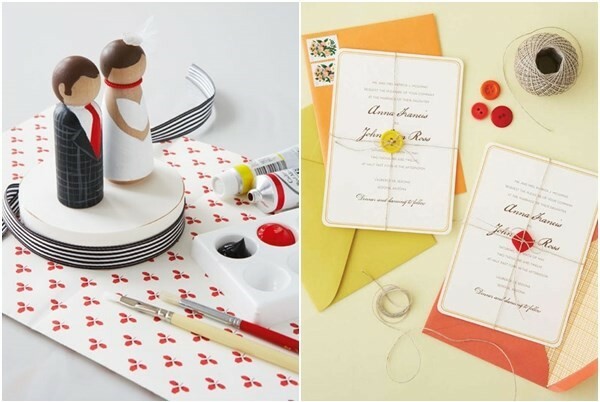 Maybe creating wedding crafts will even relieve some of those wedding jitters. In any case, crafting your own DIY wedding accessories and decorations is a way to have a personal, beautiful, and less expensive wedding.